I KNEW it was out there and I must have looked at 3953 Casablanca pics but couldn't find that exact place. Wish you would tell me where you found it! Another preview--"Getting hit by tomatoes"--over at IGN. thanks Boingo and banzai and thank for the heads up Slowhatch!! looks like they have to dig for the clue in the tomato's and Kim suggests maybe they should do the " other one "
Heee. I knew this episode had been good for my French reading skills--but would never have found it searching in Spanish (?I think?)!! It's ten miles to the Tomato Piles from Horta Park. They take a taxi so it should be in good time. What the heck are Rob & Kim thinking? could be the taxi they took happened upon the alternate detour " tomato's " by accident? I think the detour spots are too far apart for that. 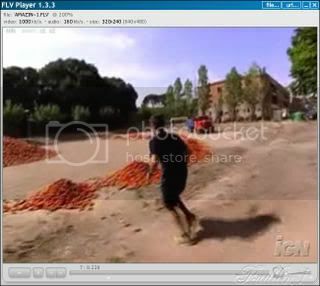 If Tibidabo Hill is the pitstop (just a guess based on the clip in the credits) then the distance from the Tomato Pile to Tibidabo is about 9 miles. OK thanks Chateau.......you'd think after " salt " in Mauritius, they would have learned their lessons that finding the needle in the haystack is almost always the wrong detour choice. See that this was taken after teams had worked the pile. Both teams are gone. Heartthrob actor Jude Law tells us all about starring in this season's romantic comedy The Holiday! And, as the Amazing Race kicks into high gear across the world... another team returns home. They'll join us with the inside scoop. Whatever the task is at Colonia Guell is also a possibility for the detour. The itinerary mentions an "art picture car" and "helpers to unload" -- I'm picturing a lot of artwork, like stacks of pictures/paintings? Like a search the paintings or search the tomatoes kind of thing? Dunno. Puddin or somebody, could you put up all the frames between these two frames from the promo? I need to determine where the camera is wrt the benches. 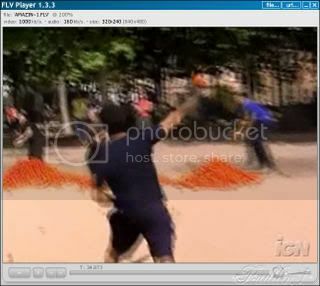 With that I can make a cosine correction that will give a good estimate of the time of the shot. ROTFL i didnt know kandice was the burger king dude!!!!!!! !